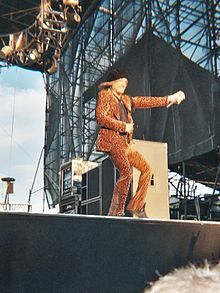 Kevin Mark DuBrow (October 29, 1955 – November 19, 2007) was an American singer of rock music. He is best known as the lead singer of the heavy metal band Quiet Riot from 1975, when the band started, until 2007, when he died. On December 10, 2007, media reported that DuBrow had been found dead on the afternoon of November 25, 2007. He died because he took an accidental overdose of cocaine. This page was last changed on 17 May 2017, at 05:42.